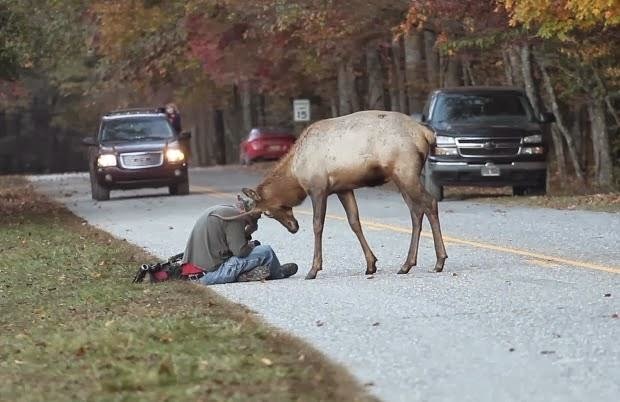 An elk in the Great Smokies National Park, made famous by a viral video, has been put down. The video showing the elk headbutting a photographer aired on ABC's Good Morning America on Thursday. News 13's Emma Wright broke the story of the elk's death on Friday. Rangers say they had been tracking the elk since late October when the video was taken. Rangers say the elk was getting too aggressive towards visitors in the park. Rangers say the elk showed no fear of humans and was probably looking for food. Rangers say after they saw the video shot by Vince M Camiolo, a filmmaker from Philadelphia, they tried to relocate the elk to another part of the park. They say the elk kept coming back to the road and getting too close to humans.